The Airbus A330neo is Europe's answer to the Boeing 787 Dreamliner. Instead of creating brand a new aircraft from scratch as Boeing did with the Dreamliner, Airbus decided to optimize the existing Airbus A330ceo or current engine option jet that has been around since the mid-1990s. 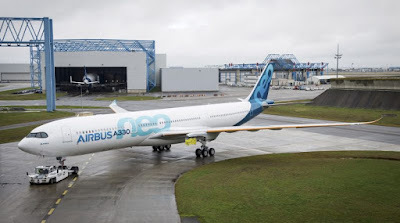 Airbus launched the updated A330neo or new engine option at the Farnborough Airshow in 2014. Since then, the A330neo has netted 224 orders from airlines around the world with Malaysian low-cost carrier AirAsia X as its largest customers with 66 on order. The A330neo's only US airline customer is Delta with 25 orders on the books. While 224 orders in four years are nothing to scoff at, the A330neo has lagged behind the rival Dreamliner in the sales department. The Boeing jet has taken more than 400 orders in the same period and has sold nearly 1,400 units since 2004. The widebody market, in general, has been slower over the past year or two and some of that can be attributed to the replacement cycle, Knittel said at the 2018 Farnborough International Airshow. The current generation Airbus A330ceo is still on sale and is one of the most popular widebody airliners in the world. As result, Knittel said, the A330 is still a relatively young aircraft in many operators' fleets and have not hit their replacement cycle yet. When you have airplanes that are older, the analysis to flip them out and put in new airplanes is much easier and in most cases fairly obvious, the former chief of executive of airplane leasing firm C2 Aviation Capital said. But the A330ceo is a good airplane with good range and has been improved a lot over the past 10 years. As the replacement cycles come and as the A330neo enters peoples' fleets, I think you will see sales accelerate on that airplane because they will see that the neo is a fundamentally improved aircraft over what was already a very good aircraft, to begin with,Knittel said.